← Not Over Yet . . .
Monday, October 14, 2013. Waking up today with no particular place to go, as the old rock and roll song says . . . you have to be my age to actually remember that song, but it is on my mind as I awaken on Monday in my funky room at the Hospidaje Santa Cruz in Santiago de Compostela. 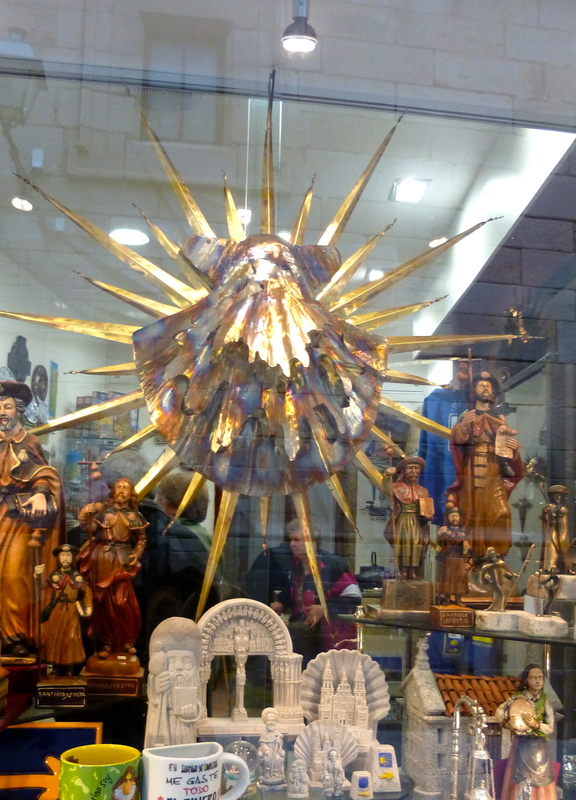 I am on my hotel street, a beautiful old stone-building-lined street, Rue de Vilar, sandwiched between the Pilgrim’s Information Office and the Tourist Information Office, making the clear distinction that pilgrims are not tourists. Today is the day I will attend the Pilgrim’s Mass at noon in the Cathedral, the first Mass other than my mother’s memorial Mass that I’ve attended in a long time. It’s certainly the first Mass I’ve attended other than funeral Masses for perhaps twenty years. Ria will meet me, though first we need breakfast. I knock on her door, next door to mine, and then wander down the hall to the similarly funky bathroom I share with four other sets of people. It’s not the private room the woman promised on the phone the other day, but it’s also not a top bunk in a municipal albergue with one hundred inhabitants, so I am not complaining. Now breakfast. The restaurant across the street from the hostal is most convenient, though more expensive, with wait-staff that can’t seem to pay attention to their customers in any ordered fashion, but I wait patiently for my eggs and toast, zumo naranja and cafe con leche, of course. It’s a time to try to regroup after my experience yesterday, walking in the pouring to Santiago. 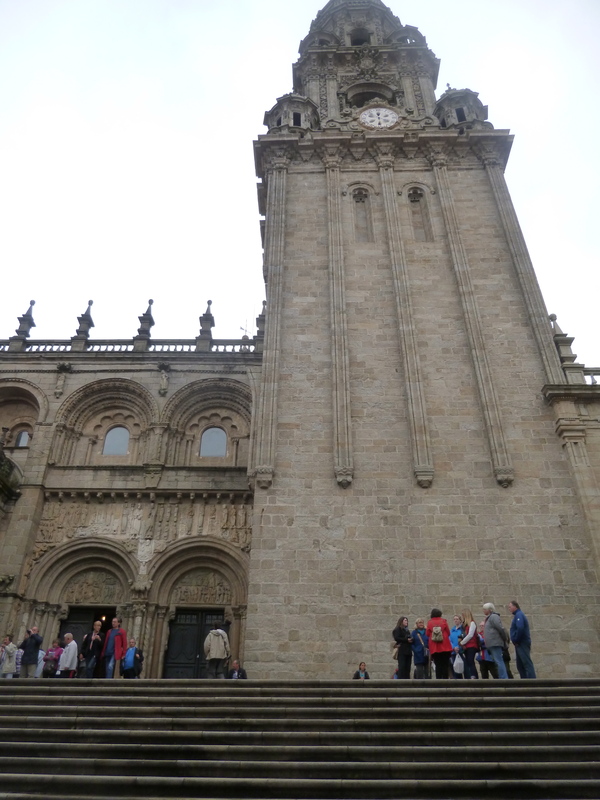 I’m hearing from other Camino walkers that the entry to Santiago was anticlimactic for them, and perhaps it is thus for many of us. Should we hear harps and angels’ voices? Should we feel as though the walk solved our problems? I did meet people on the walk that were struggling with something and really believed that if they could only “make it to the end”, they would find an answer. One can find insight from within, most definitely, on a long walk with plenty of time to contemplate a multitude of things, but I can’t imagine some “answer” will be dropped out of the sky at the entrance to the Cathedral. My thoughts turned to some of the people I had hoped to see before the end, people that most likely got here before I did. Jim and Patte, Matthé and Elma from the Netherlands, and Larry, the recent widower who is considering becoming a drifter. People I will miss for awhile. But all in all, we know that most of our Camino contacts are fleeting, pilgrims passing one another on a beautiful path, sharing a dinner or two, or a set of bunk beds. We will remember some names, other faces, some even matching up with one another, and most of them will blend into the soup that is each experience, along with the smells, sights, sounds that came our way as we walked, showered, ate, slept. I know I feel a sense of accomplishment, a quiet I hope will stay with me for awhile, and a great desire to keep walking. I had hoped to begin tomorrow or the next day to walk to Finisterre and Muxia, figuring a week for that, and a bus ride back to Santiago. But the weather is pretty miserable and is expected to be for the next seven to ten days. Christel has gathered information for a bus to Finisterre in the morning and I decide I will take all my gear, or most of it, prepared to walk from Finisterre to Muxia if it looks like the weather is breaking at all. One way or another, I’ll stay in Finisterre for the night tomorrow, though Christel will return to Santiago, because she has a flight out to Holland on Wednesday morning. Ria will come with me and we’ll play it all by ear. Right now it’s time for the noon Mass. The Botofumerio is hanging . . .
We sit in a pew that will have a good vantage point in case the botofumeiro swings today. I’m surprised that a nun with a lovely voice leads some of the service, even before the priests come out to the altar. And when the men in red vestments do come out, there are more than half a dozen of them. The lead priest says the Mass, the nun sings in the parts of the Mass I remember from my childhood. And the other priests, each in a different language, greet the pilgrims from the pulpit. It’s actually quite moving to hear these men address us in English, Spanish, German, French, Polish, and perhaps Portugese . . . We aren’t just the mob in the cathedral. We are pilgrims who have walked here, many of us from the border of France, all of us on our feet in our own sincerity. They honor us. We honor one another and ourselves. I certainly honor myself for my journey. At money collection time (there is always money collection time in a church), a short little man in a red cassock comes out wearing a sort of gnome or dwarf hat. He takes the hat off his head and holds it out for the collection. The coins jingle and jangle, more frenetically as the man passes his hat down the aisles of the massive church. Sort of looks like one of the Seven Dwarfs doing this duty, and I try not to giggle, but I am amused.The church holds 1000 people, so I’m sure more than one red-coated gnome is scattered throughout this place, but I only see this one. When it is all over, the botofumeiro doesn’t swing, though the people in the Pilgrim Information office told me that if it was hanging in the church, it would swing. But the church security person said there is a new rope, and the burner is hanging to stretch the rope. The man in the Pilgrim office, when I told him after the service, said, “Oh, seriously??? I never have heard THAT before!” And so it goes. As we leave the Cathedral . . . another opportunity to find friends one last time. As I descend the massive stone steps from the church back to my Rue de Vilar, I see Jim and Patte from Westminster, Colorado, also coming from the Mass. There’s one couple to whom I can say a last goodbye. They tell me about a place their friends are staying, across on the other side of the church. It’s a Seminario and is apparently reasonable and quite lovely, with huge breakfasts included in the room rate. I think perhaps if I reserve a room there after my return from Finisterre, they might hold a bag for me now, with things I don’t need on my trip to the end of the world. Jim and Patte are going on to other parts of Europe and we say we hope we can see one another back in Colorado, since we live only an hour apart. When they leave, I make my way around to the other side of the large stone area which houses the church, and I see the sign for the Seminario Maior across the Placa. As I enter the stately old stone building, yellow arrows show me the way to the reception . . . and a courtyard reminds me of the one at Santa Croce in Florence. I feel as though I’ve come to a familiar place. Reception attendants are quite helpful, assuring me that they will be happy to house some of my belongings safely in their store-room until I return for the reservation I’ve just made for three nights. And yes, if I decide to walk to Muxia, I can call to revise the reservation dates. Smiling, I head back to my hostel to meet Ria before lunch. Larry . 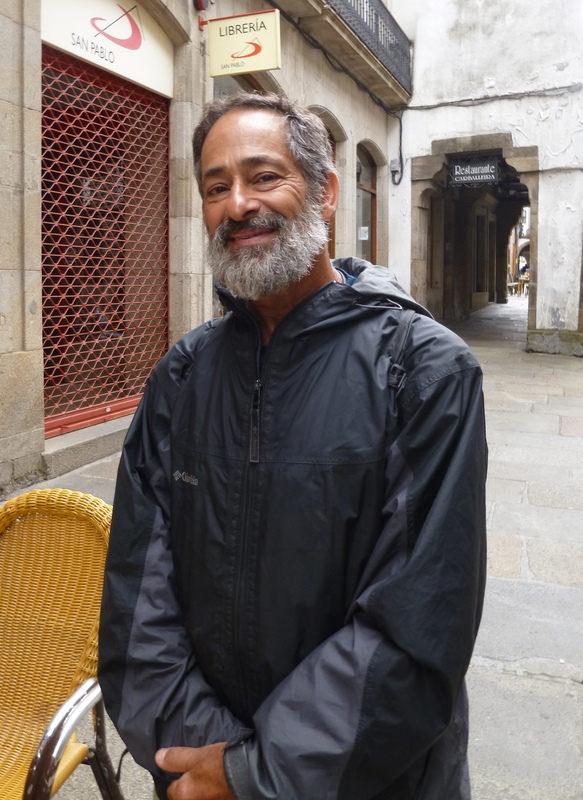 . . a dear Camino friend . . .
And as I walk down Rue de Vilar yet again, I see sitting at an outside table at the restaurant across the street, a very familiar face. It is Larry, and I can’t believe my eyes. He is with a woman I don’t recognize, having soup and salad. I stop. He looks up, as startled as I am, and interrupts the woman. “Excuse me for a moment, please,” he tells her. Stands up and holds out his arms. I give him a big hug and tell him how happy I am to see him, this nearly last person I thought I’d missed. He introduces me to the woman, I apologize for the interruption before he and I continue our conversation. He’s actually staying at the Seminario at the moment, but is arranging for an adventure in Morocco very soon. Camel rides, sleeping in tents . . . he is quite excited about his next voyage and so am I. We had exchanged e-mail addresses way back on the meseta somewhere, so we’ll stay in touch. Ria appears and I introduce them before she and I find some lunch. Tomorrow morning we will go with Christel to Finisterre on the bus. From Holland, Germany, Michigan, Colorado. To Morocco and The End of the Earth. Who would’a thunk it? So glad you continued your journey beyond the “official” end of the Camino. It’s a treat to be able to read a few more stories. Dear Joannah, here you are, what does it mean doing the Camino, we always do a Camino in my opinion, the one to Compostela is a different way to do that. It’s also a way to stay a little apart being very busy in walking and trying to get to the next place. Ten years ago I had a journey to Bukovina, Romenia, where the Communist party didn’t destroy the frescoed monasteries (that’s why I went there) because fortunately they were farway from the central power. I felt so far away from my problems and so committed to make a trip and try to find out every night a hotel and a good dinner that I had no time to think of something else, a great relief! Have a nice day, Viviana. I enjoyed this post partly b/c it makes me nostalgic for the times we spent on the road meeting and rejoining with people, wherever we were. Most people we don’t keep in touch with (besides facebook), but you look at the pictures you took and those memories come back. I’m so happy that you got the chance to do this on your own. Even if you don’t find that “something” that everyone hopes they will find on trips like these, there is a proud feeling. You feel different somehow. Thanks Justin. Probably a few more of those running into people from the road at the end stories for me. I just have to write them. And I did find the “something” I was looking for, which was a very long walk all by myself. I know there were lots of people around as I told you but I got to spend all that time walking in solitude that was what I was looking for think everybody looks for something different. Some people are looking for solutions to their problems, some people are looking for God, and others are just looking for a place to be a little quieter than they usually. I was in that camp. And maybe that’s a little different from knowing why I did it in the way that most people asked about it. When people said that, I said I have no idea. I also said I just want a long walk by myself. So I got that. Great to see you last night.